Dryer sheets pick up loose dog hair on fabric like magic. Just rub a dryer sheet over your couch or wherever else pet hair collects and watch as it clings right to it. You put rubber gloves on and run you hands over your furniture; it’s amazing how well pet hair clings to them! If your dog pees on the carpet use baking soda (which is also great at removing odors) to clean it up. Pour some baking soda over the spot, let it sit for 20 minutes and then vacuum it up. Do you get a ton of dog hair lodged deep into your carpet? Use a window squegee to pick up fur in your carpet & on your furniture. Scrape it along the carpet & just watch as that hair comes up. You can say goodbye to scrubbing off those drool marks by getting yourself some magic erasers. When you bathe your dog does their hair end up clogging up your drain? Use a baby wipe over the drain and place the stopper in over the baby wipe to help stop the dog hair from clogging it up. Don’t have a lint roller on hand? Use packing tape to pick off all that dog hair that gets all over your clothes. We cannot overstate how disappointed we are by the outcome of Amendment 13’s passing in Florida. Regardless of your personal views on racing, the reality is this Amendment did not provide any financial support or a realistic, phased time line to re-home the more than 8,000 greyhounds that will be impacted as a result of this vote. CGA is a small adoption agency that homes fewer than 100 greyhounds a year. It costs more than $500 to re-home each dog and a several-week volunteer commitment to foster. We have neither the financial resources nor the volunteer base to accommodate the imminent, and significant, increase in dogs. The alternative is bleak, with the potential for retired racers to be sent to already crowded shelters that do not understand the nuances of greyhound rescue. We will be in touch as we learn more about next steps to detail how you can help. As always, we are grateful for your support. Stop by one of our several meet and greets throughout the month. Our volunteers and their hounds would love the company! We had 1 hound find their forever home! We had 8 fosters arrive and 4 hounds found their forever home! We had 3 new male fosters, 1 female foster, and 10 hounds have found their forever home! We have 7 new fosters and 6 hounds found their forever home! We have 5 new female fosters and 5 more hounds found their forever homes! We had 3 new fosters arrive and five more hounds found their forever homes! Four more hounds found their forever homes! Welcome to Starr, Dancy, Sabbath and Kingpin!!! August was quite a busy month for CGA. We brought up 8 gorgeous new hounds in a 2 week period. Welcome to Carly, Kim, Darius, Oshkosh, Luna, Sidney, Mason and Burst. In July we welcomed Smoke and Nina to the foster crew. We also had a few adoptions as well! The month started off with a bang and ended with one as well. We had 9 deserving hounds go on to their furever homes during National Greyhound Adoption Month. Hooray!! 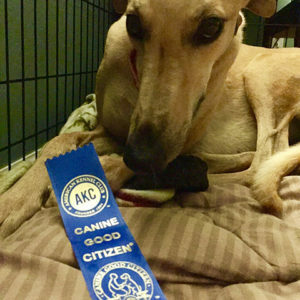 National Greyhound Adoption Month has started off with a bang! We brought up 5 new fosters on the 7th and have several adoptions to report. Welcome to Little Man, Flo, Sugar, Katie and Gazelle! Since our last update we brought up several hounds, some of which have already settled into their forever homes. We welcomed, Trixie, Levi, Kassandra, Red, Remy, Cozy and Betty. We will have their pages up soon! On November 18th 6 new pups were brought up from West Virginia. Welcome to Ray, Forrest, Honey, Blue, Mister and Van!! No tricks just treats this month. Three new fosters came in from West Virginia. We welcomed Mama, Cuda and Darla to our foster crew. We also brought back Rex into foster care through no fault of his own. Congratulations to both hounds and hoomans! It was another great month for CGA hounds. On September 9th six gorgeous hounds traveled here from West Virginia and a week later we brought one up from Alabama. Aubrey, Gunner, Irie, Shamu, Scooter, Piper and Dora joined Boomer, Hero and Legend in the foster gallery. As of today 4 of them are in their forever homes and 2 are pending adoption tomorrow and one is in the Connecticut Prison Greyhounds program and pending adoption when she graduates. We welcomed 4 new fosters this month. Joan, Philly, Hooch and PJ made their way up north to find their furever homes. Welcome to CT! Two new fosters to tell you about. Check out Wynn and Legend on our Available Hounds page. We have had 3 adoptions since our last update. We welcomed two new fosters last week. Check out Brad and Olivia's pictures on our Available Hounds page. Three new fosters arrived this week. We welcomed Brooke, Dusty and Summer. Check out their pictures on the Available Hounds page! And on the flip side, three hounds went to their forever homes so far this month. CONGRATULATIONS to Krystal and her girl Q!! Q recently passed her Canine Good Citizen test and became a Certified Pet Therapy dog. We are so proud! A Big CONGRATS TO Theresa And Abbie! One of our adopters, Theresa, and her little girl Abbie, are now a certified Pet Therapy Team! Way to go girls!! !